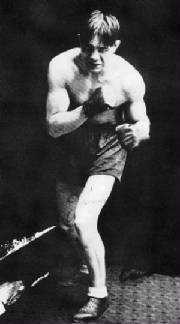 Winnipeg-born as Raymond Henry Bousquet, Fontaine twice won the Canadian middleweight belt. But a grueling, 98-fight career took its toll on the man. By the end — when he had crossed the pond for a couple years traversing the English rings — Del Fontaine was visibly punch-drunk. The onetime champion lost 12 of his last 14 fights. Punch drunk — scientific name dementia pugilistica — is just the classic diagnosis for “concussed all to hell,” afflicted by traumatic brain injury and its mind-altering long-term effects: Depression, violence, mood swings, loss of judgment and impulse control. Those are the kinds of behavior patterns that tend to brush up against the criminal justice system. The syndrome’s popular name suggests its most visible injury, to motor skills — a symptom Fontaine’s colleagues in the business could readily diagnose. If 1935 was a few decades’ shy of our present-day understanding of concussions, it was still well-enough known to those who had experience of the punch-drunk that psychological changes accompanied the physical impairments. Those who knew Del Fontaine knew he wasn’t right in the head. The reason this tribunal had to sit for the humiliating public probe of Fontaine’s mental crevasses was that Fontaine had left his wife and kids behind when he crossed the Atlantic. Once he got to the Isles, he took up with an English sweetheart in Bristol. This Hilda Meek, a West End waitress a decade the junior of her lover, became the object of an obsessive infatuation. In a fit of jealous rage, Fontaine gunned her down (and her mother too, although mom survived) when he caught Meek making a date with another man. Fontaine was captured, unresisting, dolorously on the scene, and openly admitted his actions. Acquittal on the facts would be a nonstarter; diminished responsibility because of dementia pugilistica was the best defense gambit available. The highly restrictive legal bar against an insanity defense aced out the legal maneuver: however impulsive and moody a lifetime of concussions had left him, they couldn’t be said to have prevented him “knowing right from wrong.” Still, his case attracted a fair bit of public sympathy, and when a petition for clemency went nowhere, hundreds of people, including a number of other boxers, turned up at Wandsworth to protest on the morning the punch-drunk Del Fontaine hanged for murder. Just want to say he was my moms uncle.and my great uncle.sad story and tragic for both parties.to or since then a lot of people went to the gallows and cried.